Fifteen-year-old Nina Perez is faced with a future she never expected. She must leave her Garden of Eden, her lush home in the Dominican Republic, when she's sent by her mother to seek out a better life with her brother in New York. As Nina searches for some glimpse of familiarity amid the jarring world of Washington Heights, she must uncover her own strength. She learns to uncover roots within foreign soil and finds a way to grow, just like the orchids that blossom on her fire escape. And when she is confronted by ugly secrets about her brother's business, she comes to understand the realities of life in this new place. But then she meets him-that green-eyed boy- who she can't erase from her thoughts, the one who just might help her learn to see beauty in spite of tragedy. 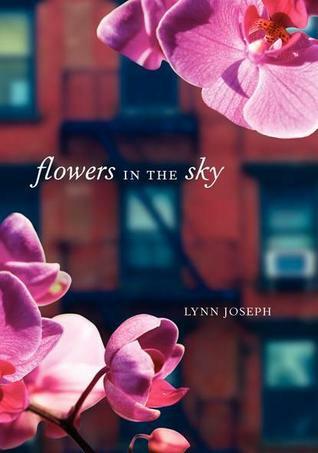 Flowers in the Sky by Lynn Joseph is probably one of the most fantastic books that I’ve read recently. I picked it up this morning and literally could not put it down. First of all, the cover is very literal and beautiful. One thing that Nina has is her beautiful garden at her home in Samana, Dominican Republic, but when she is so abruptly plucked and replanted in Washington Heights, the Dominican section of New York City, that all changes. However, life is full of changes and we all must adapt. So, with the help of her brother, Darrio, she begins growing flowers in the sky - on the fire escape out the window of their apartment. Darrio was the one she looked up to at home in Samana, but she can’t help but notice how much he has changed since she last saw him, but is it just time, or something else entirely? As Nina learns to navigate a completely new life, she feels alone. This novel centers on Nina and her struggles to find her place in this strange new world of bustling traffic and noisy people. I absolutely loved how the author painted the setting so completely. When Nina talked about the beautiful flowers and trees in her garden or the music playing as she and her Mami strolled down the malecón (like a boardwalk along a waterfront), I felt like I was sitting with her or walking with them. I could hear the music in my mind and wanted to get up and dance. Then, the feeling became completely different when she arrived in NYC and I shared Nina’s apprehension and loneliness. The characters in this book are so complete. Usually, I have at least one thing that I wish the author had done with character development, but these main characters were well defined (and mysterious) and the minor characters added the necessary filling to the story. The story is from Nina’s point of view, so her confusion is your confusion, her struggle is your struggle. Nina is constantly trying to stay true to herself throughout this journey. Darrio, who should be helping her and looking out for her, seems angry and keeps so many secrets from her. Truthfully, for at least the first half of the story, I was angry at him for his lack of honesty with Nina - what was so bad that he has to hide everything from her? Luis is the bad boy (or is he?) crush that Nina develops at the drop of a hat, but he’s tall and has amazing green eyes, so who wouldn’t? Luis is very mysterious as well, but unlike Darrio, he seems to only have the best of intentions when it comes to Nina. (You can’t help but fall for him too!) Señora Rivera is the one constant that Nina meets and has in her life. She is like her motherly figure who will always tell her the truth in the confusing city where everyone else in her life seems to want to keep things from her. Several other minor characters are also there to fuel the story along, but none of them are forced, awkward, or over-the-top (which is a big pet peeve of mine). Culture plays a huge role in this novel as well. The entire time I read, I could feel the Dominican vibe. Being a small-town Caucasian, I enjoy reading and learning about other cultures (there is very little diversity in my small town). This book was no exception. It has a smattering of Spanish words, but nothing overwhelming and the meanings are easily picked up. One thing I noticed is that in my head, as I was reading, instead of “hearing” my own voice, I heard the characters’ voices and how I imagined their accents sounded. I absolutely loved that. It really brought the story to life for me. There is an element of romance in this, but it’s barely there until nearly the end of the novel. Nina is focused on her life and navigating a new confusing world; therefore, love is on the back burner, especially when Darrio and Luis seem to be at odds. Again, this is one of the most well-written and enjoyable books I’ve read recently. Upon reading the description of the story, I went into it not knowing what to expect and was so pleasantly surprised with it, that it has easily become a favorite of mine and I would recommend it to everyone. It is truly spectacular.